Patio covers can be great additions to homes in the Des Moines, Iowa, area. 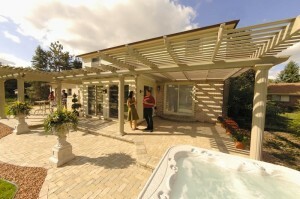 Why not have a cover installed in your outdoor living space to create a shaded retreat to enjoy with loved ones? You’ll be able to entertain, relax and read a book, and even grow seasonal, shade-sensitive plants in your new space. Durability – Your new patio cover won’t rot or become infested with insects. Low maintenance – Since the patio covers we offer are virtually maintenance free, you’ll have more time to enjoy your new upgrade instead of worrying about its upkeep. Aesthetics – Our covers can add style and sophistication to your outdoor living space. In addition to offering top-of-the-line products for your home, we also provide expert installation services. Our experienced technicians can efficiently install your new patio cover for you so that you can begin enjoying your new shaded space immediately. If you’d like to learn more about the patio covers we offer to homeowners in the Des Moines, Iowa, area, contact U.S. Patio Systems and Home Remodeling today. Our specialists are available to answer any questions you have and can tell you more about the products and installation services we have available.